Back in the early days of learning how to cook, I, like anyone, made a lot of stupid mistakes. One of the silliest mistakes I made was using part of an ingredient and then throwing away the other part(s) that I wasn't using. Case in point: eggs. Whenever I would make a recipe that called for egg yolks, I foolishly threw away the whites. WHAT WAS I THINKING? Hello?! There's a whole other meal in those whites. 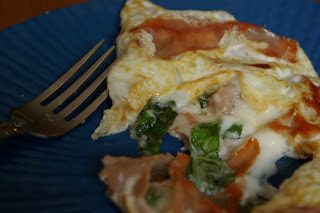 I recently made ice cream that called for 6 egg yolks, and I am horrified at the thought that a couple years ago, those whites would've been tossed down the garbage disposal rather than having the opportunity to be a part of this delicious prosciutto, basil, and egg white omelet. Oh the injustice of it all! I'm still making plenty of mistakes when it comes to cooking, but I'm glad I'm not making that one anymore! Oh... I WANT that omelet. I looks heavenly!! Years ago, I would have thrown away the unused portion of the egg, too. Guess we learn as we go. So glad you learned one of the combinations for egg yolks and egg whites. My favorite combo is whites for angel food cake and use the yolks for making noodles. Unfortunately, that's a lot of eggs and a lot of work. I only do it once a year now. I know! Now I make meringue cookies or (like you) a yummy egg white omelet. I can't believe I used toss out food when I was new to the kitchen. I admit I never know what to do with extra yolks. The whites I can use but the yolks. Any ideas for a future Weekend Cooking post? If I had extra yolks, I'd probably make creme brulee since it's insanely simple to make and doesn't involve a lot of ingredients. That is so funny that you wold only use the yolks-cooking is an adventure-some good some not so good.